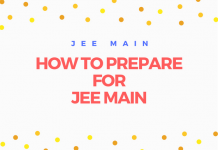 CBSE conducted the JEE Main 2018 Pen and Paper Mode Test on 08 April 2018. 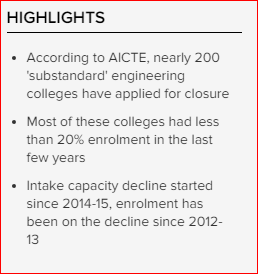 As per AICTE, that around 200 engineering institutions applied for progressive closure this year, which would dip the number of B.Tech/B.E seats in India close to 1 Lakhs i.e. 80,000 seats. Furthermore, these colleges had less than 20% enrolment in the last few years and that made them apply for closure. Looking at past few years records the engineering seats is decreased by 3.1 lakh including 80,000 closure seats added for the current 2018-19 academic session. 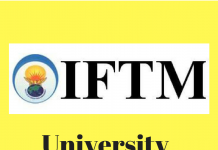 In the past few years, there has been a gradual and systematic increase in the number of seats and institution in IITs and NITs. Nearly 200 ‘substandard‘ engineering institutions have applied for closure. 11.5L Students Registered for JEE Main exam and whereas 10.5 lakh students appeared for the JEE Main Offline (Pen & Paper) examination. 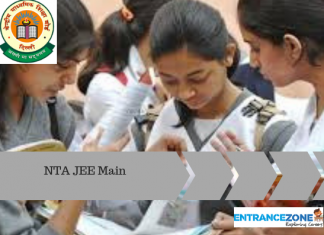 The registration for JEE Main enrollment declined from 2012-13. 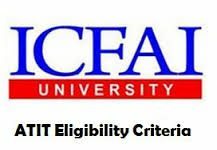 AICTE has also notified that by 2022, at least 50 percent of all the branches in technical institutions must get their accreditation from the National Board of Accreditation (NBA). At present, only 10 percent of the engineering courses/branches are accredited in India. Since 2016 the number of engineering seats started declining. While the seats decline started since 2014-15 session, Whereas enrollment started declining since 2012-13 reaching 7.87 lakh in 2016-17 from that of 9.73 lakh in 2012-13. Based on AICTE 2016-17 data, 3,415 technical institutions offering architecture and engineering programmes at the undergraduate level in India and during this period approximately 50 institutions had close down. 80 Government colleges among 800 technical institutes sent closure notice by AICTE due to poor enrollment. Check the list of AICTE Approved Progressive Closed Institutes for the Academic Year 2017-18 here. Many colleges that will continue to function may need to cut down on the number of courses as there is less enrollment in the particular course. i.e. courses with below 20% enrollment in particular colleges need to be closed. Also, the majority of the programmes offered are yet to be accredited.